OMG! I was expecting a new Personal best but not a ribbon, THANK YOU EVERYONE!!! The blue stuff is actually mist that went a bit crazy after I tone mapped the image giving it a strange effect, I quite liked it, however, it this was advanced editing I would of dealt with a few bad points in this shot including the strange blue mist and the white blown SUN around the crane. THANK YOU SO MUCH for my first ever ribbon, All I can say is "MAN THAT WAS HARD". Somebody was interested to know how this was done, well it was pretty simple really to be honest, I used PHOTOMATIX to tone map a single JPG then i exported to PHOTOSHOP where I played with the HUE/SATURATION to create a general BROWN flavour, some CONT/BRIGHT adjustment layering. basically that was it and done a USM on it all. GOHON! sorry for late for comment ...because i was too much busy for slave for you ... so for give me.. yohoho. Congrats on your first ribbon!!! I was waiting this time from looooong time ago ! Yattane Marac! omedetohhhh!! daisuki! congrats on the red ribbon, i think you deserved it. Hopefully this`ll be the start of many ribbon shots from you Marac! I really love your shot Marac and it sure deserves a ribbon. Hope you get another soon, you deserve it. By looking at your original this is not a great shot. Actually, its very average from a Photography standpoint. This is an example of very nice post processing. Congrats on your ribbon. Irie Marac!!! Big Up everytime, sight!? This is no longer a photograph. While this is an exceptional photograph, unless I'm mistaken, tone mapping in Photomatix is not considered legal under basic rules. Yes? No? Maybe? Message edited by author 2006-12-29 21:20:41. A lot of dodging done here ! Almost like a painting. Great shot. Great photo, congratulations on winning the yellow ribbon! way to go MAK! congratulations! a good sign for 2007! congrats on the ribbon mate. Nice to see you making progress on the front page! and futhermore: I'll do you for that. Congratulations on your ribbon!!! I love this shot so much and gave it a 10. Well done!!!! Great shot MAK and congrats on your ribbon. It sounds like you have an affinity with this place and I think you have done it justice. Simple image but so effective. Well deserved! Congratulations on your first ribbon. Very cool shot!! Congrats on the new personal best and on the yellow ribbon!! Thank you so much everyone for making my week. Reading some of things people have said about this shot, which is a simple shot of a bridge where i grew up as a child, I remember standing in this same very spot with a group of friends for hours, chatting and hanging out, it was OUR bridge. There used to be a cafe with a snooker table in at the bottom of the bridge but it has long gone now. The view remains the same of cause but the trains that pass have changed. It means a lot to me because I shoot for myself, granted my editing has come a long way since I joined DPC but I still shoot to please myself and when a photograph that means so much to me personally can have a warming effect on many people across the world it makes me feel wonderfull and was the perfect way to end the year. Marac, Well done! Congratulations-you deserve it! Hey, Marac, BIG CONGRATULATIONS on your well deserved ribbon! Way to go!!!! Congrats Mak on the ribbon. i love the tone mapping on this. i need to get up to pseed on how to do it. Nice post-processing here, congrats on your first ribbon! feels like a painting, congrats on your first ribbon and new personal best score!!! you deserve this man, enjoy the ribbon! Whoooohooooo for you ribboning! Congratulations on your first ribbon, Marac! I figured this might be you when I saw it. Nice basic tone mapping; glad I'm not the only one using it :-) Congrats on your ribbon! Congratulations for your result ...and the ribbon !! Excellent shot, was in my favourites. What are the blue areas in the top of the pic, at the limit of horizon ? You make brown look so incredibly beautiful!!! Way to go!! Beautiful... Congrats on your first ribbon! Sensational work! Congratulations on your first ribbon! Hi Marac, huge congrats on your ribbon with this amazing shot. Congrats on your first ribbon! I think this would have done well in the Pink Floyd challenge as well. 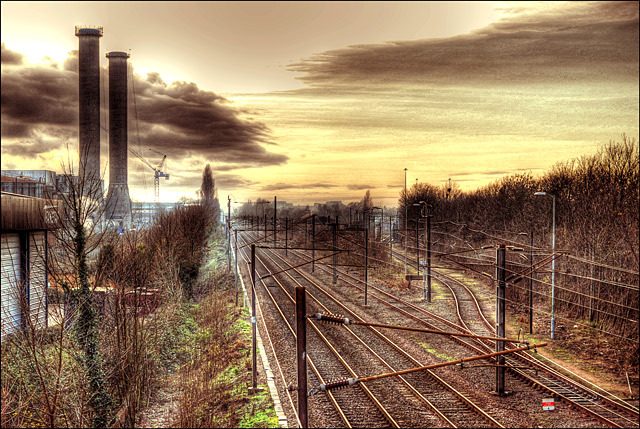 Great shot and the tonemapping works well. Gives it a cool surreal look. Bumping up to 9. Holy this is a great shot, i think it is definitely ribbon bound. Nice work. It almost looks HDR. Wow nice work again. A simple composition, but with quite a lot going on. Very nice! Looks a lot like a painting, except for the tower crane. Does HDR go for basic editing? This looks like an old painting. The colors are beautiful and it turns what seems to be an ordinary landscape into a scene of beauty. I love this photograph! This really should ribbon. The detail is amazing. I love the sky. This is a great picture. I like the poistion of the train tracks. They really draw your eyes into the picture. My favourite. Very surreal feeling. Ubelievable light. Beautiful post editing. I love it. Great use of HDR. Wow! HDR? I need to learn how to do this... I would've given you a ten had it not been for the strong white spot just below the crane off on the left side. I know, I'm being pretty picky here. Great job though! Cool...love the surrealistic look that you have obtained! is this straight from the camera? The antique feel of time passing in this picture is outstanding. Well done post processing. 10. If I was there, I would stare out at the pensive, melancholy beauty for hours, lost in thought. wow.. seems to be and hdr photo.. it is alla done with 1 exposition? very nice pic! 7! Excellent shot, the composition is very nice, the colours too ! What are the blue aeras at the limit of horizon ? Proudly hosted by Sargasso Networks. Current Server Time: 04/23/2019 12:26:03 PM EDT.